When it comes to style ripped boyfriend jeans I'm all about wearing them with heels, yellow high heels this time! I just love this masculine/ feminine mix that gives an ultra -feminine result. Now let's talk a little bit about the upper level of this outfit. Coat: vintage, another great find that I'm crazy about it. The shape, the length, textures and fuzzy collar are the "ingredients"that make this coat a statement piece on my list. Under this heavy coat I wore a delicate patterned shirt once again thanks to Sugarlips.com. Accessories are minimal as always, this gold bracelet (courtesy to Lumiere Collection.com), M.K clutch and Nine West sunglasses. That's it for today! Until next time have a wonderful week and thank you for stopping by. 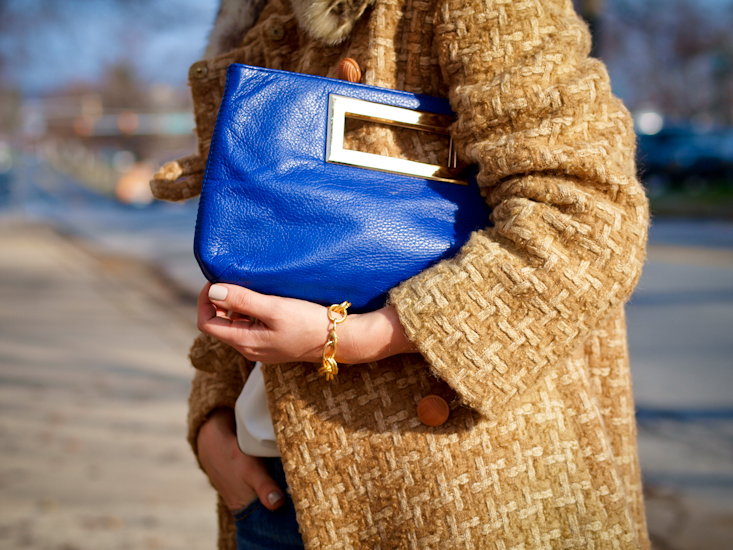 LOVE THE PATTERNED COAT AND THE CLUTCH IS GREAT..ALWAYS A FAN OF DISTRESSED JEANS AND HEELS! how do you like ours today post? It’s the first time I write a comment on your blog, but I’m following you for a long time now. I love the way you mix colors and patterns. You always look amazing! the coat is fabulous! i really love the print and colour! wow, you are always so stylish, how do you do that? Oh wow Veronica, I’m breathless. It’s seriously my favourite look of yours! You’ve created a million of fabulous looks but this one is the best in my opinion. 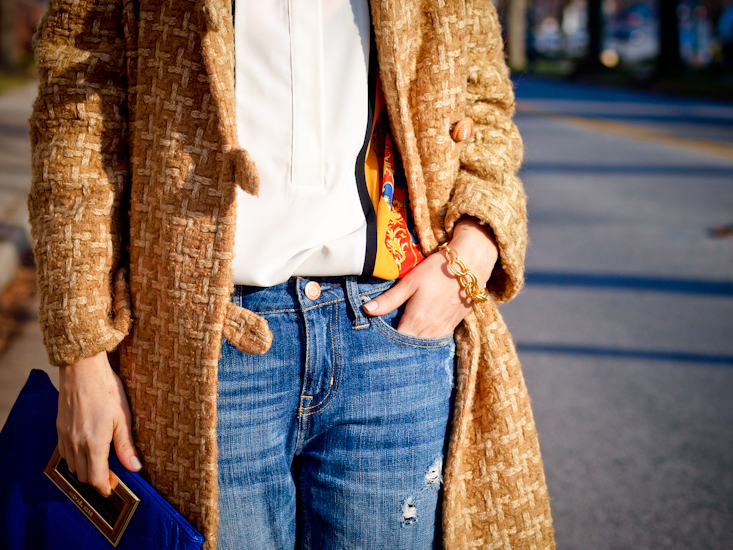 I love the combination of modern, lose-fit boyfriend’s jeans with the classy vintage coat! Such a cute look! Obsessed with your mustard pumps! wow! amazing! love your coat!!! Can I have those cool heels!!!! Oh i love the coat and the top and the juxtaposition with the jeans!! This is great! I love the combination of blues with yellows & gold. Jeans are one of my signature go-to pieces of clothing & pairing them with those yellow heels is just so much fun. Beautiful! I really love your coat and shoes so much! so perfect! what a magnificent lux gem of a vintage coat this is my dearest Veronica! A piece able to instantly uplift any look! Excellent!